2800 Jobs available in Punjab PSPCL Asst Lineman Jobs Notification. Candidates who have completed 2 years Apprenticeship in the trade of lineman are eligible for the current recruitment. Interested/ Eligible candidates can apply online through the official website of PSPCL for this Assistant Lineman Jobs. Online application process starts from 29-Nov-2017 (10.00 AM) to 19-Nov-2017 by 06.00 PM. Last date to deposit fee is on or before 26-Dec-2017. 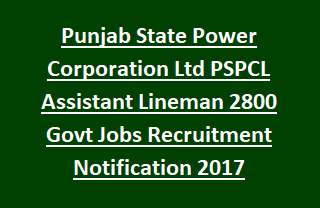 For more details like Available Vacancies, Required qualification, Selection process, Pay Scale of Punjab State Power Corporation Ltd PSPCL Assistant Lineman Jobs Recruitment 2017 are given below. See the official notification of Punjab PSPCL Asst Lineman Jobs Recruitment. Online Registration Starts from: 29-11-2017 (10. 00 AM). Last date to register online applications Step 1: 19-12-2017 (06.00 PM). Last date for depositing application fee: 26-12-2017 (Before closing hrs). There are total 2800 vacancies available in Punjab PSPCL. Candidates must qualify Matriculation/ ITI in Electrical/Lineman trade from recognized board. Applicants who have completed 2 years Apprenticeship in the trade of Lineman are eligible for Asst Lineman Jobs. Preferences will be given to the candidates who have done 2 yrs Apprenticeship in PSTCL/ PSPCL. Candidates applying for PSPCL Punjab recruitment should have minimum age of 18 years and upper age of 37 years. Candidates will get fixed monthly payment of Rs. 6400- Rs.20200/- plus Grade Pay Rs. 3400/-. Selection will be purely merit basis only for the candidates who have completed 2 years Apprenticeship in PSTCL/ PSPCL are considered for these vacancies, In case the above mentioned candidates are not available, then the Committee will consider other state/ BBMB candidates. For the selection process please refer Punjab PSPCL official notification. Interested candidates can apply through online from PSPCL official website @ http://www.pspcl.in/. Before filling the form read the instructions and official notification of Punjab State PCL carefully. Upload the documents and submit the application before due date. Online registration starts from 29-Nov-2017 (10 AM) to 19-Dec-2017 by 06.00 PM. Deposit application fee at State bank of Patiala SBP before closing hrs on 26-Dec-2017.